Martin Skrtel has been at Anfield for quite a while now and amidst talks of extending his contract, we look back at his performances starting from the 2012/13 campaign to the current one. Karthik Ramakrishnan statistically analyses the Slovak’s performances to give a better judgement on whether the 30 year old has improved over the recent years. 30-year-old Martin Skrtel recently completed seven years at Liverpool. Coming on the back of a good performance at Zenit, Skrtel was snapped up by Rafael Benitez on a four-and-a-half-year contract. Quite simply, the fact that Skrtel has seen through that period and then some, indicates his longevity. He has 207 appearances in a Liverpool shirt and of the 15 goals to his name, quite a few have come in important contexts. In the present starting 11 at the Anfield club, Skrtel is one of the most experienced players. Despite that, one would be safe in saying that his stay with the Reds has not been awash with exemplary defensive showing. All the same, Skrtel has managed to be in the reckoning for the better part of those seven years. The club is in the mood to extend his contract. This comes closely on the heels of certain impressive performances in the recent past. That notwithstanding, there has been many a shout to somehow restrain the club from giving the player a contract extension. 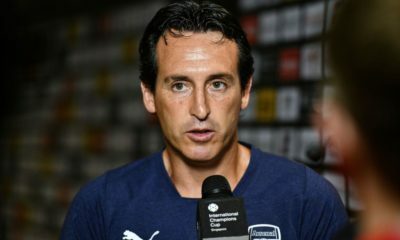 His over fondness for being way too physical in the box, his propensity for bizarre errors and of course own goals have been pushed in the way of this argument. Being a harsh critic of the player by my own admission, I must say that my voice was one of those. But taking a saner flavour to his performances across the past few seasons have caused me to mellow down. Skrtel has won 22 tackles in the 20 games that he has played this season. In the 2012-13 season, where he played for 2080 minutes in 25 games, he recorded 29 successful tackles. His high point came last season when in 3221 minutes of football in 36 games, he won 36 tackles. He has lost 14 tackles until now this term, as opposed to the miserly amount of 7 two seasons back. Skrtel was at the unsuccessful end of 36 tackles last term, a season characterised by woeful Liverpool defending. Liverpool’s defending on the whole has not been outstanding this season. Although in recent times, there have been encouraging signs, the defense on the whole has been found lacking more often than not. Starting with a rather shaky campaign, Skrtel has come back rather strongly to cement his place in the starting eleven. He seems to have donned on a rather responsible avatar, probably realizing that he is one of the senior most members of the current Liverpool squad. 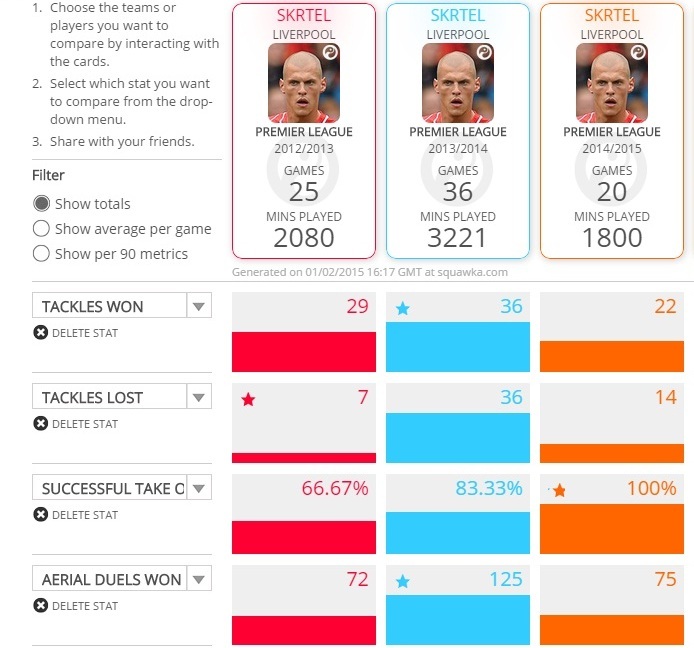 If these numbers are anything to go by, although they are not exceptional, Skrtel’s season is definitely looking up. An encouraging sign for Skrtel fans is that he has been 100% successful with all the take ons that he has attempted in this season so far. 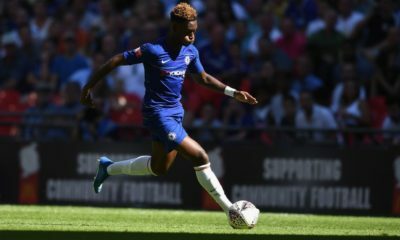 Progressively from the 2012-13 season, his successful take ons numbers have increased from 66.67% and then to 83.33 % last season to the present number. This could be a veritable sign of the player being more comfortable with his movement and being more easy on the ball. This is one nagging facet of Skrtel’s game that always gets thrown into sharp focus. In this season where Liverpool have failed to replicate the blistering form of the term past, the defensive holes have become more prominent. Skrtel’s flirtations with jostling opposition players in the box and his reluctance to rather give it his all during an aerial challenge has been pulled into question. The numbers support him rather well. He has won 75 aerial challenges in the 20 games that he has played this season, as opposed to the 72 he won in the 2012-13 season. Last season though, he won 125 aerial challenges; but just 20 games into this season and if Skrtel decides to carry forward this recently found good form, he could overtake last season’s stat. Skrtel has committed just 17 fouls this season. For all the outcry about his rather diffidently aggressive ways, he has seemingly mellowed over the past few seasons-mellow and saner. While he committed 28 fouls last season, he was at the wrong end of a tackle 22 times in the 2012-13 season. 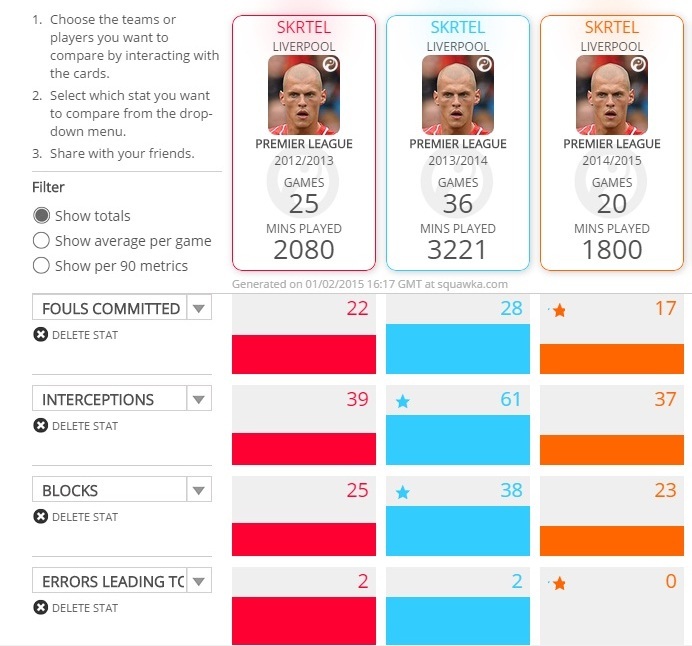 This array of stats at least point to the fact that Skrtel may indeed be improving with a stellar flavour. He is quite on par with his tally in the 2012-13 season as far as interceptions are considered. 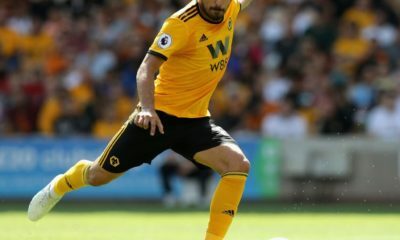 37 interceptions in 20 games this season and 39 interceptions in 25 games in the 2012-13 season seem unflattering numbers but he has made some crucial interventions this term. The context is always crucial while analyzing numbers, as numbers by themselves never tell the true story. Skrtel’s case pays testament to that. He has blocked 23 advances by the opposition this season. He made 38 blocks last season and 25 blocks in the previous one. 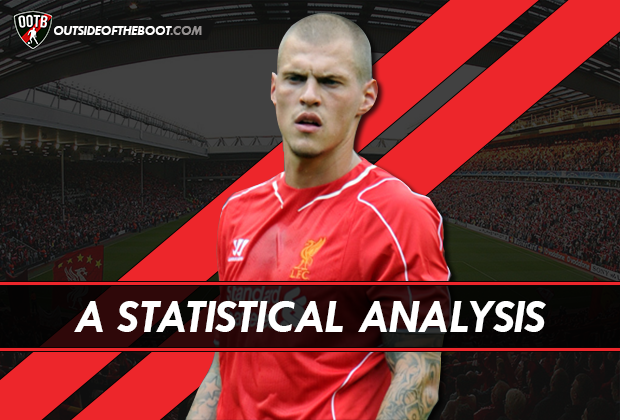 After Daniel Agger, Skrtel has not found a rather constant and stable partner at the centre back position. Like forwards who play off each other with great aplomb, defenders also need august, steady company to bring in their A game to every possible match. Considering Liverpool’s seemingly perpetual defensive deficiencies, Skrtel’s slow, incognito rise seems to be well timed. This probably is the crowning glory for Skrtel case that he is definitely improving. While he almost always seemed to be a tall, bumbling liability, he seems to have ironed out those rather gaping chinks in his Slovakian armour. While he had two errors each in the previous two seasons that led to goals, he is yet to make such an error this season. For all his misgivings, he is yet to make such a fatal error. Yet. Not being a big fan of his over-aggressive ways, I must admit that talk of contract extension angered me. Defensive problems were many last season around but due to the explosive attacking performances, the defensive mix-ups did not seem that huge a liability. This term though, with the attack being rather toothless more often than not, the hole in the back has been accentuated. That definitely calls for better defending. Considering Rodgers decided not to recruit new players for that purpose, the onus thus fell on the existing defenders to rise up and with the occasion. Steven Gerrard’s imminent departure of the club seems to have stemmed from the apparent hesitation from the club administration to give him a contract extension way back last year. In an attempt to maybe shore up the team’s line up, Skrtel could be offered a new contract. If that is so, it rather seems to be shaky ground. Had Daniel Agger been present at the club, the entire texture of the defensive setup would be different. With the club parting ways with Daniel Agger in the summer past, better performances were expected from the Slovak. Although there has not been an exceeding excellent improvement from the big defender, a closer inspection at numbers suggests otherwise. Martin Skrtel, it seems, is clawing his way to good from. At 30 and at the threshold of a contract extension, it would seem that he could be on his way to peak form. Some steady show by this defender at the heart of Liverpool’s defense would go a long way in Liverpool’s quest for a decent finish this term. A failed engineer now taking the plunge into journalism, Karthik has always been awestruck by football. A Liverpool fan, he likes to write about his favourite club as also anything offbeat and fancy. He is a featured columnist for Alive For Football and The 4th Official. He is the founder of and writes for Always Kicking Around and maintains a Monday column for Fresh Liverpool as well as occasionally writes for Empire of the Kop.